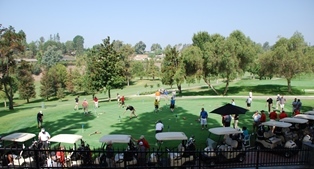 NORWALK, Calif. – September 5, 2014 – The Cerritos College Foundation raised $65,300 at its 29th Annual Golf Classic on August 4 at Friendly Hills Country Club in Whittier. A well-attended field of golfers enjoyed a complimentary putting competition and then hit the links for a day of golf. The tournament had a record number of sponsors, including Title Sponsor Tilden-Coil Constructors and Falcon Sponsor GST, Inc. A long list of corporate sponsors also contributed, including Alta Dena Certified Dairy, Canteen Vending and Office Refreshment Services, Caston, Inc., Frantone’s Pizza & Spaghetti Villa, Gerald P. Roodzant, DDS., HMC Architects, HPI Architecture, Kaiser Permanente, Los Angeles County Supervisor Don Knabe, P2S Engineering, RDM Electric Co., Inc. S&K Engineers, Southland Motor Car Dealers Association (SMCDA), The Pepsi Bottling Group, The Vinewood Company, Union Bank and Zebra Coffee. Merrill Lynch sponsored the annual Helicopter Ball Drop that kicked off the awards dinner. An energetic crowd gathered to see whose winning ball would drop in the hole. This year had only one lucky winner who won $2,000. The Foundation announced a new feature to its annual event called Fund a Scholarship. In total, $2,850 in scholarship donations was collected for veterans and foster youth. The live auction also raised $3,000. The Foundation presented Cerritos College students Jamie Ramirez and Arianna Hernandez with the 2014 Nancy Kelly Academic Scholarship awarded each year to outstanding female athletes in softball who display high academic achievement. Arianna has always had a strong desire to become a registered nurse. She believes nursing is her life’s calling and the profession that gives her the privilege to serve others with integrity and compassion. Arianna will transfer to California State University, San Bernardino. The 30th Annual Cerritos College Foundation Golf Classic is scheduled for August 3, 2015 at Friendly Hills Country Club. BEVERAGE SPONSOR – The Pepsi Bottling Group; Triangle Distributing Co.